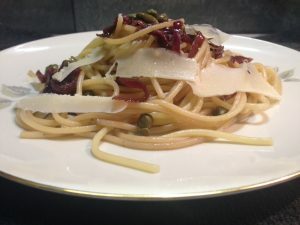 For this recipe you can use capers in coarse salt or in the salted water. 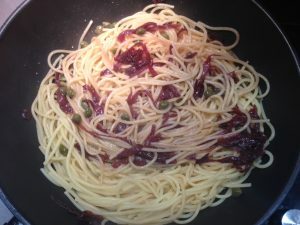 If you are using the capers in salt you will need to rinse them first in running water and then bath them in lukewarm water for about 10 minutes changing the water several times. So how did I do it? Super simple. Slice the onions into strips and separate them from each other. Place them together with olive oil into your deep pan and saute them over light heat. Once the onions have heated up a bit add salt, pepper and wine. 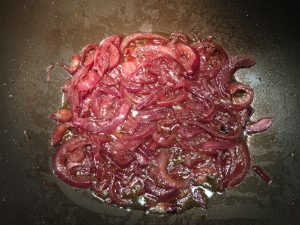 As wine evaporates while you are cooking onions you can add a small amounts of water so that they wouldn’t stick to the bottom. Cook it for about 15 min (or until soften). Cook your spaghetti as shown on the box, drain them and add to your pan. Stir well all together and add capers. 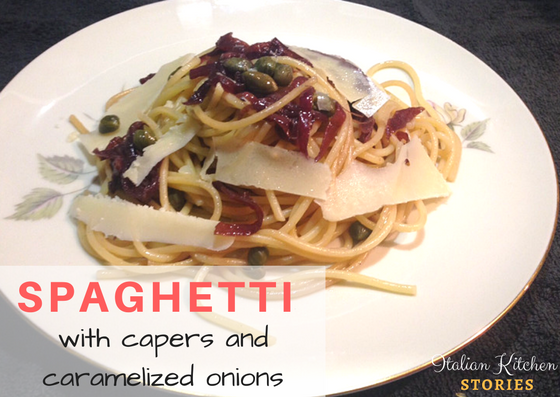 Serve your spaghetti with capers and caramelized onions while its hot. You can serve this spaghetti dish before your main meal. If you prefer staying on the light side for your dinner time, just add some salad and you will have a complete meal. Leave me a comment if you have tried this recipe and what did you think about it.